NEW YORK—Two men with bright red vests and yellow lettering stand behind a bus stop in Manhattan on Aug. 5. They try chatting with people waiting for the bus, and offer them fliers. In front of them is a banner colored in red and yellow like their vests, and like the Chinese Communist Party’s flag. The men aren’t out petitioning or protesting. They’re trying to spread hatred towards Falun Gong, also called Falun Dafa, a traditional Chinese spiritual practice based on the principles of truthfulness, compassion, and tolerance. Falun Gong has been persecuted in China since 1999, and the fliers the men spread and their banner both contain the Chinese regime’s propaganda against the practice. Just several feet away four women hold very different banners. These expose the Chinese regime’s crimes against humanity committed in the persecution against Falun Gong. A large group of others practices the Falun Gong exercises in quiet protest of the Chinese regime’s persecution—which has targeted one in every 12 Chinese people and stretches to all levels of Chinese society. 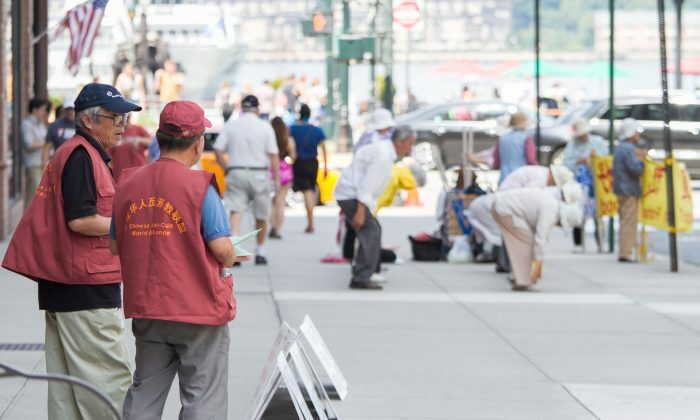 Falun Gong practitioners in New York City say they are increasingly being followed by the group with red vests. While the Falun Gong practitioners are trying to expose the Chinese regime’s persecution of their practice in China, the people with the red vests are trying to spread hatred against Falun Gong. “They tell people untrue things,” said Betty Huang, 60. Huang regularly distributes human rights materials in Manhattan, and said within the last week the group with red vests set up shop just several feet from her on the sidewalk. Attempts to interview two men who are part of the group with red vests yielded little. One of them, a pudgy man who appeared to be in his 50s didn’t respond to questions. Another man who was thin with bulging eyes merely muttered and stared off into the distance. The leader of the group, Michael Chu of Flushing, Queens, has repeatedly declined to comment. Yet, the red vests the group wears tells plenty. On them, emblazoned in bright yellow are the words, “Chinese Anti-Cult World Alliance.” To understand the significance of those words, requires some understanding of the Chinese regime’s persecution of Falun Gong. Among those most responsible for the arrests, torture, and forced organ harvesting from living Falun Gong practitioners in China that began in 1999 is former minister of public security Zhou Yongkang. Zhou was in charge of China’s Central Political and Legal Affairs Committee (PLAC), the umbrella organization that was in charge of almost all parts of China’s judiciary, security, and penal systems. The PLAC oversees the 610 Office, the secretive Party organ specifically created to arrest and torture Falun Gong practitioners in China. The 610 Office is accompanied by a public organization, the “Chinese Anti-Cult Association,” which helps spread the Chinese regime’s propaganda and seeks to incite public hatred against Falun Gong. In China, it also assists and advises the 610 Office from the civilian side on methods to directly persecute Falun Gong practitioners. Chu’s “Chinese Anti-Cult World Alliance” uses the same materials and runs many of the same propaganda operations as the “Chinese Anti-Cult Association” in China. Chu doesn’t try hiding his connections to the Chinese Communist Party (CCP). Among the nine titles on his business card are two for organizations that are under the Chinese regime’s departments for foreign espionage. Chu was also a consultant for the All-China Federation of Returned Overseas Chinese since 2004, according to its website. The organization gets its orders directly from the Working Committee of central CCP. Nearly a week ago, the CCP’s disciplinary body announced that Zhou Yongkang was being formally investigated for “grave violations of discipline.” This investigation is part of an ongoing purge that has been carried out in the name of opposing corruption while targeting those officials who may be disloyal to Party head Xi Jinping. Soon after the investigation of Zhou was announced, Chu’s group with the red vests increasingly started showing up wherever Falun Gong practitioners were in New York. Given Chu’s connections, the sudden increase of operations by the “Chinese Anti-Cult World Alliance” is seen by the local Falun Gong practitioners as an effort by Chu and his group to assert their loyalty to the CCP, after the fall of Zhou Yongkang. The organization Chu runs, and its attempts to vilify Falun Gong, tie to events that began in 2007. Zhou Yongkang gave a speech, according to Amnesty International in December 2007, saying that China needed to create a “harmonious society and a good social environment” to hold its 17th Communist Party Congress and the Beijing Olympics. For the regime to do that, Zhou said, “We must strike hard at hostile forces at home and abroad…” Among the “hostile forces” Zhou mentioned were persecuted groups including Tibetan Buddhists, Uyghurs, and Falun Gong practitioners. Following Zhou’s speech, the Chinese regime’s persecution “at home” intensified. Amnesty reported that Chinese authorities increased its efforts to imprison and silence persecuted groups to keep them quiet and out of sight during the Olympics. As for Zhou’s call to “strike hard” at similar groups “abroad,” that came to light in New York in May 2008. During a rally in Flushing, Queens meant to expose the CCP’s persecution of Falun Gong and call on Chinese people to renounce the Chinese Communist Party, more than a hundred people suddenly showed up and attacked, threatened, and harassed those attending. The Chinese regime’s state-run media also showed up at the event—they typically avoid such rallies. Xinhua and CCTV then sent fake reports into China claiming the human rights rally in New York was an event trying to block donations for victims of the 2008 Sichuan earthquake. The incident began a series of attacks against Falun Gong practitioners in New York City, which continued with intensity for several months. After numerous people who launched the attacks were arrested, however, and after people behind the attacks were revealed—including the New York Chinese Consulate General Peng Keyu and several Tong leaders—things began quieting down. The people launching the attacks on Falun Gong didn’t go away, however. They merely changed tactics. They set up tables on the street where they distribute materials to vilify Falun Gong. In this way the operations of Chu’s “Anti-Cult World Alliance” began. For Chinese people in New York who practice Falun Gong and have been granted asylum, Chu’s organization and its activities often bring to life memories of torture and fear. Falun Gong practitioners generally, as well as their supporters in society and government, tend to view Chu’s organization as a tool used by the Chinese regime to export persecution abroad, taking advantage of the open society of the United States. For Zhou Yongkang, the attacks in Flushing solved two issues. On one hand, the attacks turned the Chinese public’s attention away from his role in the high death toll caused by the 2008 Sichuan earthquake. As the former Party chief of Sichuan Province from 1999 to 2002, Zhou bears some responsibility for the political corruption in Sichuan. That corruption resulted in what locals called “tofu buildings“—in particular school buildings—that crumbled during the earthquake. On the other hand, Zhou used the attacks to spread the persecution against Falun Gong abroad. Sources in Flushing told Epoch Times in 2012 that Zhou sent a representative to give an award to one of the more prominent actors in the attacks against Falun Gong in New York. The “Daring to Struggle” award was presented to the woman by Zhu Yibiao, from China’s PLAC, during an event on the Chinese Lunar New Year attended by around 50 people at a restaurant a few blocks from the Queens Library in Flushing. New York was a testing ground for the tactics used to attack Falun Gong practitioners abroad, high-level sources inside China told Epoch Times in 2008. The predictions seemed true, and later in 2008 and into 2009 similar attacks took place in several Chinese communities around the world, including in Paris, San Francisco, and Hong Kong. The only two places the activities have continued with force, however, are in Hong Kong through an organization called the Youth Care Association, and in New York through Chu’s organization. “I think the Chinese Communist Party’s persecution has come to an end. There’s nowhere to go,” said Yi Rong. A man some describe as a community leader in Flushing, New York heads organizations that serve the interests of Beijing.